Beginner crochet tips from a pro who has 50 years of experience! 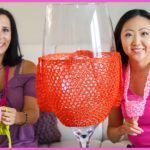 Stacey Schmidt has been crocheting since she was 5-years-old and shares her best advice for those just starting out, her history with textile creation, and we test out her signature product available in her Etsy shop – wine glass holders! 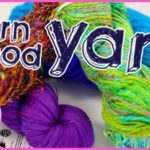 Darn Good Yarn Haul + Review in my quest to learn knitting and crochet. Gorgeous yarns and fabrics to blow you away!